London Mayor Sadiq Khan took aim at some "very stable geniuses" after his speech was interrupted by a group purporting to support Donald Trump. 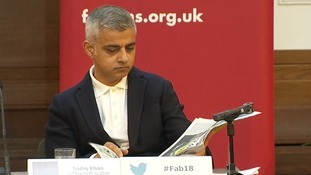 Mr Khan managed only a few words at the left-wing Fabian Society conference in London when a few demonstrators called for him to be arrested. One man, reading from a prepared sheet, said: "Ladies and gentlemen, we're here today to make a non-violent, peaceful citizen's arrest." The group also declared slogans in support of Brexit as one man held aloft American flags. The men from the White Pendragons group were apparently angry at the mayor's continued opposition to a state visit by the US president to the UK. However, ITV News Political Correspondent Paul Brand said some appeared opposed to the Muslim mayor for his religious views. Resuming his keynote address on gender equality with the group cleared, Mr Khan made light of the protest. Their protest lasted around 20 minutes - during which Mr Khan read the newspaper and a rival protest of anti-Brexit supporters was cheered by the crowd - as the police were called in to deal with the disruption. Referring to Prime Minister Theresa May's most recent Tory conference speech, which was interrupted by a prankster, he said: "On the plus side I wasn't served with a P45." He then took a dig at the American president who recently described himself as a "very stable genius". Mr Trump confirmed on Friday he had cancelled his proposed trip to London. He said he did not want to cut the ribbon on the new US embassy as he deemed the building's relocation a "bad deal".